Champion camper. First-rate tailgaiter. Happy hour hero. 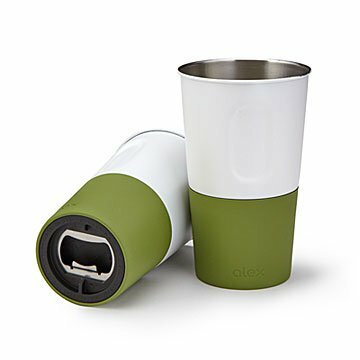 On the road or under the stars, this insulated, stainless steel tumbler was built to join in the fun (there's bottle opener on the bottom), even when the going gets rough. Never fear: neither kombucha, cocktails, nor beer will corrode the inside. The silicone sleeve makes for easy gripping, and it fits standard cupholders, can go on the dishwasher, and is stackable for storage. The only way this baby could be better if there were two of them—and guess what, there are! Set of 2. Designed in California. Made in China.